After receiving a remarkably high number of submissions, we are ready to announce the bands that ranked highest in the first phase of our Year End Poll. A huge thanks you to all of the bands that submitted their music, the results show the diversity and talent that covers Portland’s DIY scene. Please note that the Portland editor wasn’t eligible to vote for any of the bands that submitted. Instead, the submissions were reviewed by three Deli editors in different cities. WHAT'S NEXT: Now that we’ve finished up the first step of the poll it’s time to reveal the bands nominated by our local jurors. The jurors who gave us their opinions are experts on Portland music - working as promoters, bloggers and with platforms that promote local music. Noone knows the scene better than them. 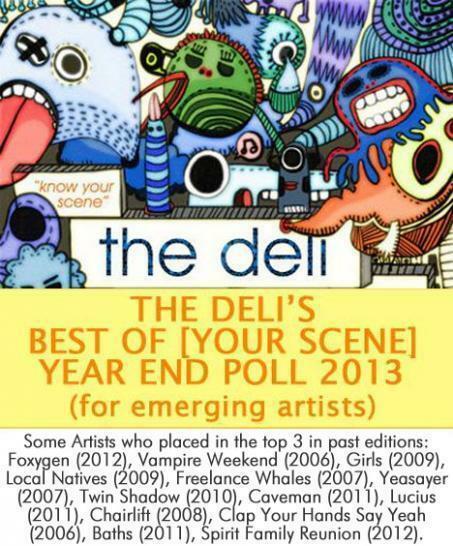 Once all of the bands involved are announced, our viewers will have the chance to cast their votes to determine who will be named The Deli Portland’s Best Emerging Artist of 2013. Thanks again to all of the bands who submitted their music and spread the word about the poll, stay tuned for the next phase of the poll.